Home of the Branded "I Love" Horses! The Brooks breeding program features sires that are sons of Autumn Acre, Peppy San Badger, Smart Little Lena, Playgun, and Plumb Dry. Our program also entails great dam bloodlines such as that of Tap O Lena and Tapt Twice. The careful selection of superb broodmares is equally important. Brooks Ranch foals are privileged from birth. 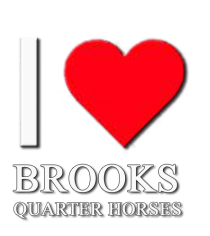 Brooks Quarter Horses are the result of our own desire to benefit from the best working horses in North America. There is a great deal of work to get done around here. Smart, strong, and well-mannered horses are indispensable. From moving livestock, to roping, sorting, and cutting, a real cow horse gets real experience. A solid foundation in reining skills is also essential. Would you like a horse that knows honest work? Simply put, if you plan to excel in the equestrian world, you need to choose a great horse. They are here, learning and working, and you can benefit from them as well. Please read through some of the testimonials that we have received from many loyal customers. Their reactions say it best. We welcome your questions and comments, and look forward to helping you find a truly great horse!! !